I have been trying to lose my halo halo virginity for well over a year now. A freaking year! I discovered this crazy cool concoction on Instagram one day and ever since I have been dreaming of the day that I would get a chance to give this a whirl. My day finally came at Tou & Mai in the Midtown section of Detroit, MI yesterday. This Tou & Mai review will cover my first time experiences at this neat little place that is nestled down in the Midtown area of Detroit. I was going to share this post for my Tried It Out Tuesday feature but I am really eager to share the details with you and since it is Sunday, maybe you can head on over there today to give this extraordinary and unparalleled dessert a try! There truly is no other dessert on this planet like it. Tou & Mai is a quaint and curious place! There is so much to see and take in, in such a small space. The first thing you see when walking in is the big white menu. I analyzed the menu online before visiting so I already knew what my strategy was when it came down to deciding and ordering. I started off with a passion fruit boba tea and of course I had to get myself the Hello Hello (their version of halo halo). Click HERE to get a better look at the menu. I planned on getting the Hello Hello most definitely and I wanted to try out the Tricolour Tapioca but bummer… they were temporarily out of that dessert. That one sounded so fascinating to me and it will be next up on my list of to-try items at Tou & Mai. Here is a description of the tapioca dessert. Since I could not try out the tapioca I figured I should go ahead and satisfy my boba addiction with a Sweet Tea Boba. I went with the passion fruit flavor. The passion fruit boba was the perfect amount of sweetness and the mango star jellies were a big bonus to go with the exotic flavor of passion fruit. If you have never tried passion fruit the way it can be best described in my terms is a sweet and sour exotic fruit. It has the perfect balance of both. It currently has earned the top spot on my list of favorite fruits, for the moment anyway! 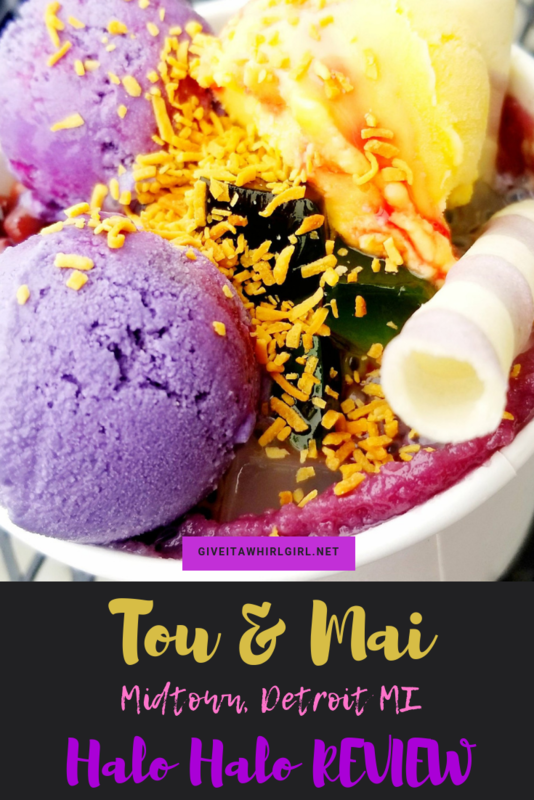 If you like your boba milky you are in luck because Tou & Mai also offers Sweet Boba Milk Tea in a variety of fun flavors. And if slushies are your thing they have those available as well! Here is a list of the flavors available for slushies. I really need to go back to this place to explore the menu more just look at these options below for new garnishes available. FLAN! ZOMG! What the heck is halo halo? Halo halo is a famous dessert in the Philippines. To create it they use a purple ice-cream that is derived from a purple yam, otherwise known as ube. It also has a scoop of mango ice cream, coco de nata, aiyu jellie, basil seeds, red adzuki bean, sala cider, coconut milk, condensed milk, wafer roll, and toasted candied coconut. Wowza! That sure is a lot to take in and process right? Google might just have to be my friend here to tell me what exactly it was that I ate! Let’s explore this a little bit more! This was my first time trying ube and when you put that together with all of these other unique ingredients you get one hell of a memorable dessert! Having actual beans in my dessert was also another first for me. They include red adzuki beans in this dessert. Odd huh? These are sweet red beans and they are a magnificent source of protein! A one cup serving of these beans is a whopping 39 grams of protein. I would say they use about a quarter cup in their Hello Hello. I enjoyed these beans immensely! For the next ingredient Wikipedia sure came in handy so I included that information as a quote directly from he source. This is really a complex dessert! I really had to use Wikipedia for the aiyu jellie as well since I am not familiar with it whatsoever. Basil seeds! I did a little research and discovered that these seeds are void of calories but rich in antioxidants. They are also great for your skin and beneficial for a diabetic. The sala cider is a fruity ingredient but I could not gather much information on that. If anyone has knowledge of this ingredient, feel free to leave me a comment and fill me in. The Hello Hello here also used coconut milk and condensed milk. The dessert is topped with candied coconut which is sure to satisfy your sweet tooth and it also has a beautiful orange glow to it. And let’s not forget those two wafer sticks that really stand out and scream halo halo! No halo halo frozen treat is complete without those wafers. There were two in the dessert and the three of us sharing. Joe, my husband, got left out. More than just a place to grab dessert! Need to do a little bit of Asian grocery shopping? You can certainly load up here at Tou & Mai. They packed in a lot of Asian goodies in this small space. My 8-year-old daughter had fun looking at all of the colorful and peculiar packaging. Anyone want to send a crisp new $100 bill my way because I sure would have a ton of fun blowing a big wad of money in this place. Chloe sipping on a Passionfruit Sweet Tea Boba at Tou & Mai in Detroit Actually stealing MY drink lol! They also have various flavors of fresh macarons available at $2.49 each. I have no doubt they are delicious but honestly I felt as though the price was somewhat steep for one macaron so I passed. Bummer! The flavors did sound intriguing. Tou & Mai also has a small selection of ice-creams available for $3.29 a scoop. That price seems reasonable to me. If you are not going to go with their Hello Hello dessert at least treat yourself to some of that delish purple ube ice-cream. You won’t regret it! Then you can boast to your friends that you tried a purple yam ice-cream! Wink! The air is getting quite crisp and nippy so if you are not into cold treats on cold days they have some hot beverage options. The tea flavors are unusual and impressive. I am definitely going to stop in here on a chilly day and give one of those teas a whirl! I am all about trying new things and I love the tea flavors they offer. The only problem? Deciding on one flavor because they all sound interesting. Want to learn more about Tou & Mai? So are you going to hop in the car and make a trip down to Tou & Mai today? I hope that my Tou & Mai review will inspire you to visit this unique place! This entry was posted in Local Spots I Visited, Tried It Out Tuesday and tagged aiyu jellie, Asian, Asian market, basil seeds, boba, boba tea, candy, candy shop, Chloe, coco de nata, detroit, filipino, frozen treat, halo halo, Hello Hello, Japanese, mango, Midtown, milk tea, passionfruit, Phillipines, red adzuki bean, slushies, sweet tea, tea, Tou & Mai, ube, unique. Bookmark the permalink. OMG! That not only sounds delish, it looks incredible! I just put in on my “need to try” list. I never knew these existed … thanks! Tou & Mai is a delightful place. Enjoy!